Somehow, between the time I was a little girl and now, ‘advent’ in our culture has morphed into something so very different from what I remember. There was so much wonder, so much mystery in the reading of scripture each Sunday leading up to Christmas. We would gather together around the advent wreath where Heather and I would debate over whose turn it was to light the candle that week. As my dad read from the Bible, we couldn’t help but feel the significance of the moment, even though we had heard those familiar words so many times before. This was a time for pausing amidst all of the hustle and bustle of the season and truly reflecting on the wonder of a king being born in the dark of night in a filthy barn. There were no trinkets from the dollar store. No specialty candy from Trader Joe’s. No old pallets transformed into hanging advent wall art or little bags strung around the room filled with treasures. Just a simple circle of greenery with red berries tucked in and those long white candles. As a mom now myself, I’m trying to keep the traditional celebration of Advent alive. Oh sure, we have several different ‘countdown’ things happening around the house. In fact, those little paper Hallmark houses I had as a child currently reside on a table in our upstairs hallway. And please hear me when I say that I absolutely love the creative ways that people have found to help build the anticipation of Christmas in their homes. 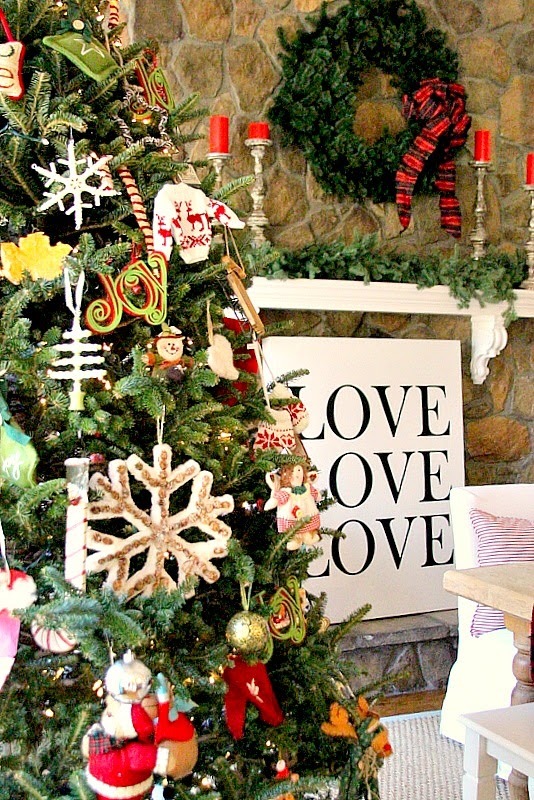 But, as I looked around my house this year and saw that it was practically bursting with Christmas in every nook and cranny, I found myself longing to carve out a little space for something more simple. 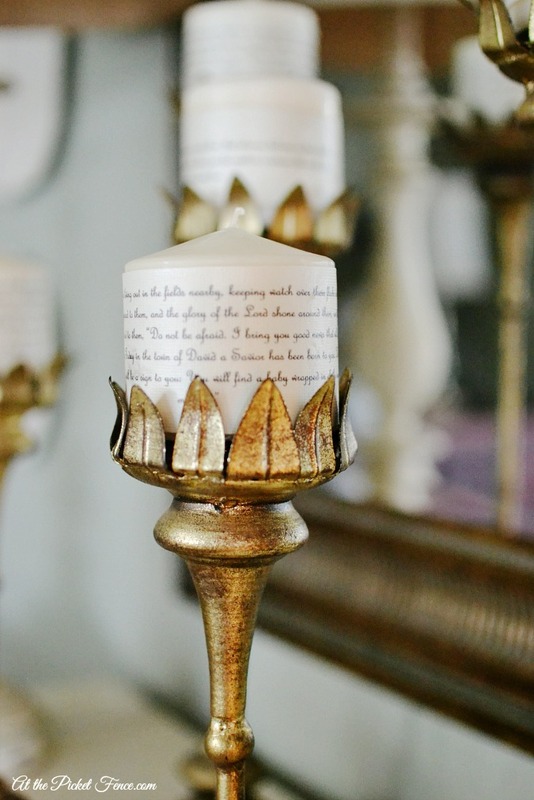 Something as simple as candles wrapped in scripture. Each one telling another part of the story of Christ’s birth. 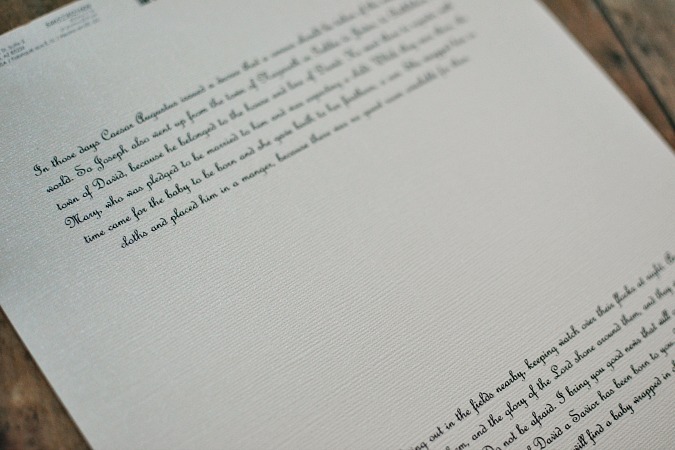 After printing out 5 different portions of scripture, I coated the backs of the paper in mod podge and then set them seam side down to dry. I then applied another layer of mod podge on top of the paper. Each week, we will gather around these candles. There will be fidgeting and fighting over whose turn it is to light the candle. There will probably be some eye rolling and some ‘hey why don’t we get chocolate with these?’. But we will all be there together, pausing in the midst of the craziness of this time of the year to remember why we celebrate. Every year, I wait for that one moment. The one where I find myself overwhelmed by it all. Not overwhelmed by the shopping or the decorating or the baking. But the one where I’m overwhelmed by the love and grace that came to this earth in the form of a baby. And that this baby would grow up to teach, to heal, to challenge, to fulfill a promise. As I ran errands around town yesterday, the song ‘Born in Bethlehem’ by Third Day came on the radio. You’ll die for all our sins? You will rise again, You will rise again! I was reminded of how deeply loved I am. There is so much mystery in it. So much that I don’t understand. But I know that if I were the only person on the planet, that baby would have come just for me. And He would have come just for you! May you have moments of being overwhelmed by His love this season! be sure to stop by for loads of ideas and inspiration! 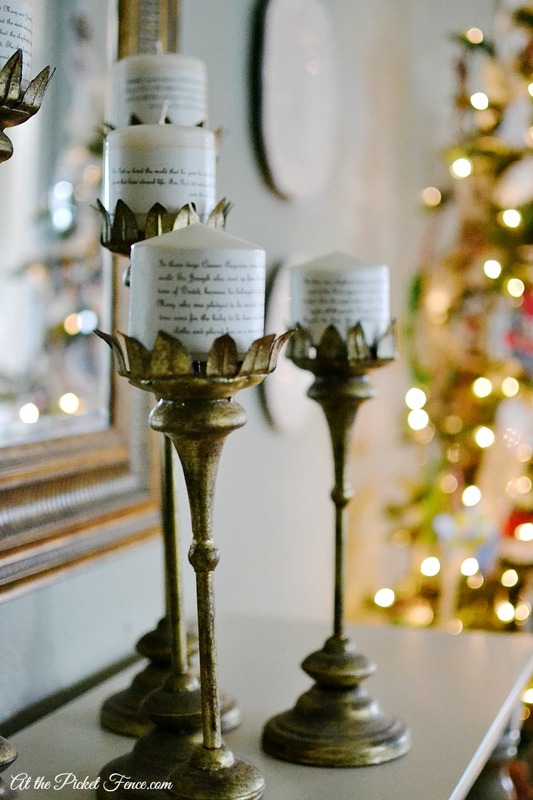 27 Comments on "Scripture Wrapped Advent Candles"
Love these, Vanessa… it’s too easy to forget the reason for the season these days and I think we could all use some more quiet space and moments of being overwhelmed. 🙂 Have a blessed day! Vanessa, how wonderful to pause and reflect on the real reason for the season. Thank you for the beautiful reminder! What a wonderful way to spread God’s love. It was beautifully written. This is beautiful! Your creation and your message….well done!! Refreshing to see and hear this in these days!! Thank you! I am longing for the “simple” things in life as well. A beautiful story. Thank you for sharing! 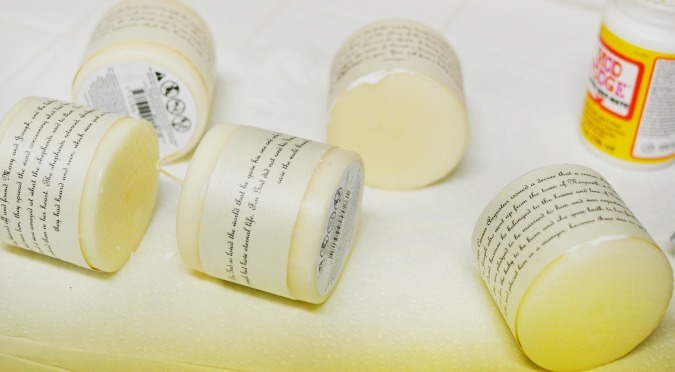 What kind of paper is the Scripture printed on? This is another beautiful reminder to me of how precious Christmas can be if we keep things simple. I have been sick since before Thanksgiving, most of the time in the bed, and The Lord has kept me from worrying that shopping is not done and neither is decorating. But reading and reflecting on the Advent season has been precious for me this year. Thank you for adding to that. Oh these are so beautiful! I think I’m heading to dollar store to get some candles! A beautiful post reminding us to slow down and focus on the best gift of all–the Savior. I love this idea and thank you for the reminder. Your candles are beautiful. Which scriptures did you use? Vanessa I have moments like that too…I always love reading your posts!! 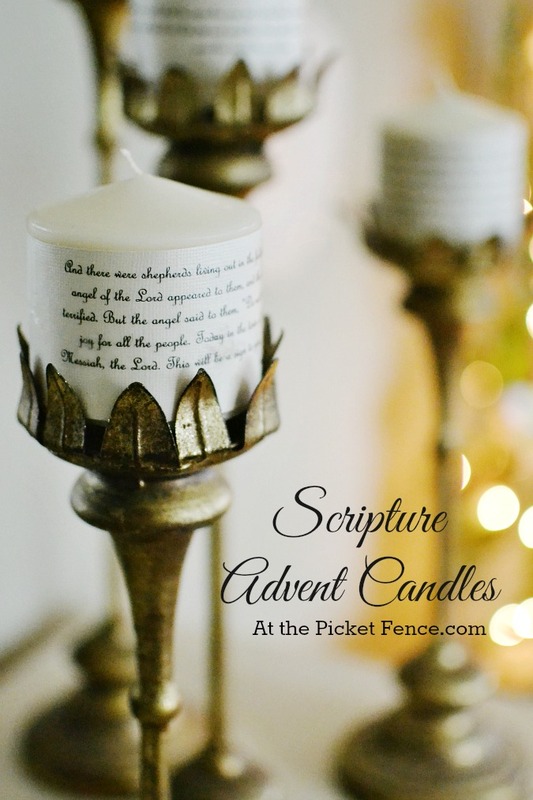 Love your advent candles! 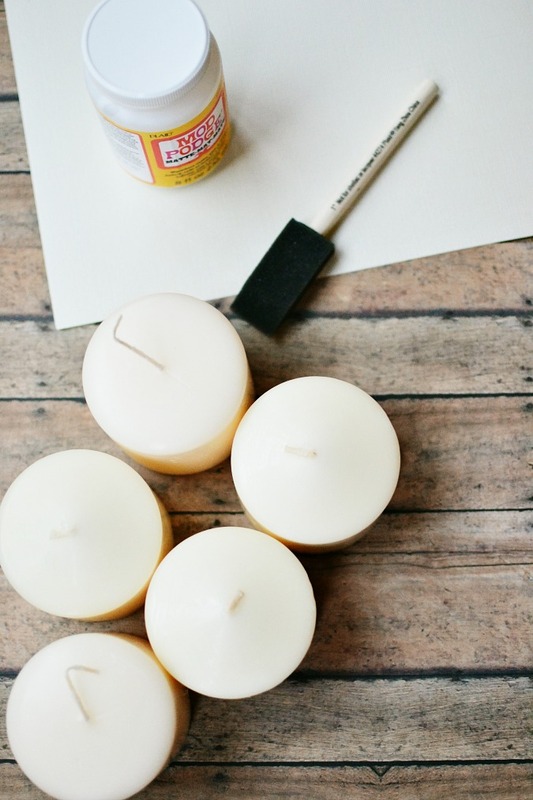 Beautiful candles…great idea..just love them Vanessa! Oh My! I just LOVE this idea…I think I might try it today! Thank you for the creative inspiration! I’ve had this post pinned since last year & just came back to reread it. We grew up with similar traditions & I’m so excited to add these candles to our contemplation and celebration this year! Would you mind sharing which Scripture/readings you used? Thanks so much! Loved this Post (as I love all your Posts)! I am always looking for ways to simplify Christmas so that we focus on the true Joy of the Season. This Post reminded me of the first time my Mom fashioned an Advent wreath when I was young. My sister and I jostled for a turn to light the candle too. I lost my Mom to cancer before I was an adult and missed the opportunity to thank her for those simple traditions. Thank you for bringing back a very warm memory! I would love the scriptures you used also and wondered if I missed you providing them to print.